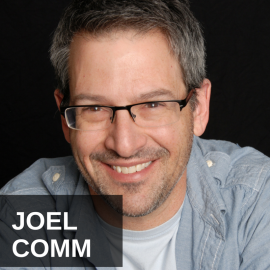 Jason Hartman: Hey, it’s my pleasure to welcome Joel Comm to the show. He is a New York Times bestselling author of several books. One is the AdSense code – think Da Vinci code – and What Google Never Told You About Making Money with AdSense. He’s also the author of So What Do You Do? Discovering the Genius Next Door with One Simple Question – that’s his latest book. And former host and executive producer of The Next Internet Millionaire, and he’s coming to us today from beautiful Denver, Colorado. How are you doing, Joel? Joel Comm: I’m doing great. Thanks for having me today. Jason Hartman: Well, hey, the pleasure is all ours. I’ve been wanting to get you on the show for quite a while. I’ve been stalking you, so it’s good that you’re here. Joel Comm: Well, I hope that I can live up to your expectations. Jason Hartman: Alright, well, me too. So, your latest book, let’s talk about that one first, Discovering the Genius Next Door with One Simple Question. Do you want to tell us what the question is? Joel Comm: Well, the question is the most common question that is asked when you meet somebody, usually in a networking event or any type of business event for the first time. After you learn their name, we inevitably ask “So, what do you do?” And often times we want people to hurry up and finish telling us what they do so we can tell them what we do. Jason Hartman: When we stop and actually listen to what people have to say, we get an opportunity to really connect with the souls and hear what they’re passionate about, how they’re using their God given talent, skills and abilities and personality to bring value to the world around them. And it’s not just the so called gurus that have something important to say. I believe all up and down every street here in our great country and around the world there are people that are following their own passions and using those talents, skills and abilities they have to have the impact on their families, their communities, and the world around them. So What Do You Do? focuses on regular people that are doing extraordinary things. Jason Hartman: I have asked that question many times myself and I like when people ask it of me. But I remember one time, Joel, many years ago a guy answered with I will not be defined by what I do. And I kind of thought about that. I thought he must have been a little put off about me asking that. And then I thought are you kidding me? You spend at least a third of your life working and probably more, and hopefully you’re passionate about that work. I didn’t think that was a bad question. Joel Comm: No. And the irony is that you didn’t say I’m gonna define you by what you do. What do you do? Jason Hartman: I guess he thought I would. Joel Comm: Yeah, he came up with something. All you wanted to know is how he spends his time and how he brings value to the world through whatever types of activities he does for a vocation. And I think it’s a legitimate question, it gives insight into what people are all about and that’s why I’m excited about the book, I’m excited about the people in it and they all have inspirational stories because if you’re touching lives, there’s a reason we do what we do. It doesn’t come out of a vacuum. Part of it is nature, who we are, part of it is nurture based on our experiences in our lives and that natural proclivity that we have to certain types of activities and behaviors. We could say, well, I sell books. But as a bookseller, maybe that’s because you’re passionate about books. Maybe there’s something about the written word that’s near and dear to your heart that attracted you to that industry. What is it about it? What’s the story? Was there some special encounter that your parents read to you or a teacher? There is always a backstory. And that’s what I really hope to pull out of the story that the co-authors are so lucky to contribute it. Jason Hartman: Yeah, fantastic. So, it’s kind of a Chicken Soup for the Soul format, right? You’ve got a bunch of different contributors? Joel Comm: Yeah, Chicken Soup for the Soul meets The Entrepreneurs. So, the stories are inspirational and you get to understand the backstory of why they do what they do, but then you also learn about how what they do brings value and in many cases there’s practical tips for both life and business in each one of the chapters. Jason Hartman: Let’s talk a little bit about marketing, but no matter what you do, you probably need to be marketing it or no one’s gonna know about what you do. What are some of your best marketing ideas nowadays? Platforms, ideas, tricks, tips, whatever. Joel Comm: The best ideas are always the most unique ideas. I think when we look to try to copy what other people are doing successfully in marketing, we become that copycat. And I think marketing means that we need to take a look at the product service we’re offering and determine who the audience is that will talk about what it is that we’re doing because the best marketing is word of mouth marketing. You can advertise and spend a ton of money on TV and radio ads and Facebook ads and Google ads, but if people aren’t excited about what you’re sharing with them and excited enough to pass it on to others, then you can just spend a lot of money. So, it’s really all about the story that you tell and who your target is that is going to retell that story for you that they’ll be excited enough about what you’re sharing that they want to share it with others. And that’s today what we call viral marketing. Jason Hartman: Yeah, well, getting that virus to spread, the idea virus as Seth Godin calls it is certainly important. Any tips on doing that? Getting that kind of engagement? When I look at my different Facebook pages for all of my different brands, on one level it’s great to have a lot of likes but the real thing to me is how many people are talking about this? That’s the engagement, that’s the virality. Would you agree? Joel Comm: Absolutely. It comes down to how many people are sharing what it is that you’re putting out there and what that reaches as a result. If it’s not compelling enough for people to share it with other, then it doesn’t have enough steam on its own. And, of course, as a marketer I’ve seen it go both ways. I’ve seen it go both ways. I’ve seen things that I do that I thought would be highly viral fall flat on their face and not go anywhere and then I’ve seen other things just really take off and before you know it it is spreading like a virus. And it’s all about the story that you tell. We love stories. Again, back to books, right? But it’s not just books. It’s film, it’s radio, it’s podcasting, it’s through TV. We are a living stories as human beings. Our life is a story. Music is the soundtrack of our lives. It’s all the story that’s unfolding before us and we get to play a role in telling that story. So, it makes sense that the most compelling marketing is going to be story-based. Jason Hartman: Yeah, I agree with you. However, I think a lot of entrepreneurs and a lot of marketers, Joel, really struggle with how to tell the story or they don’t think they really have a story and they’re just focusing on here’s my product, here’s my service. You hear the benefits of it. Maybe they do the old Dale Carnegie fact bridge benefit, which that’s legit, I think that’s good, but it’s elementary, right? It’s not as good as a good story. Any tips on crafting that story and retelling it? Joel Comm: I don’t know if I’m dating myself or not, but when I was growing up there was a guy by the name of Drew Alan Kaplan. And Drew was big into gadgets and electronics. And he put out a monthly printed catalog and it was called the DAK Catalog. Jason Hartman: I remember that, yeah. Joel Comm: Okay, well the DAK Catalog was a magazine really because you would open it and every page would have a product on it but that product, it wasn’t just an advertisement for that product. Drew wrote a story to go with his experience with each one of these products, why he tried it out, what it did for him, how he felt when he tested out those new speakers or this new vacuum cleaner or whatever the gadget well, and he drew you in by connecting with human emotion. And the core of any story is it doesn’t connect with our hearts. It’s going to be really difficult for it to connect with our mind. Now, I’m not saying that we don’t buy some things purely out of logic, we do. We know it, we’re looking for some land for our computer. It’s great if there’s [00:10:26] and they’re like blazing fast and we’ll get work done at twice the speed, but really, if we know what it is we want, we’ll think logically. But often, if adjectives can be put in there that connect with emotion, we have a much better chance of making the sale, of connecting with somebody. And that’s why I’m reminded of storytelling because Drew did such a fantastic job. In fact, for people who are interested, I think you can just go online and google the DAK catalog and I’ll bet you somewhere there are scanned copies of these pages. It was brilliant copyrighting masterful storytelling and I know it was one of those things that it wasn’t a magazine subscription I paid for. It was a free catalog and I so looked forward to getting it every month. Jason Hartman: Right. That’s great. It’s kind of like the J. Peterman catalogue, the stories and that kind of stuff, and that’s great. It’s interesting because I looked up the Wikipedia entries for it and that was a big company. He eventually filed bankruptcy in 1992, but for a while in the late 80s it was $120 million a year business with 400 full-time workers and 3.8 million catalogues. I guess that storytelling works. Joel Comm: It did. And on eBay a few years ago, I found somebody auctioning off the catalog and I had to buy one. So, I have in my collection and nostalgia an original DAK Catalog from the late 80s. Jason Hartman: Yeah, fantastic. Any other tips on crafting and telling that story, maybe bringing it into some entrepreneurs that you know or maybe we all know? Any ideas for them? Joel Comm: Yeah, let me just give you something right out of my own. In 2010, I wrote a book called KaChing: How to Run an Online Business that Pays and Pays. And of course KaChing was that cash register sound. And as a promotional item to help connect with people and tell that story in a more vivid way, I was inspired by Staples’s Easy button. You know, “That was easy”, the big red button. And I created and had manufactured a KaChing button. Same size and shape, but it was green with a dollar sign on it, and when you press it, guess what, KaChing. And I sent these off to editors and book reviewers and people who would be promoting my book so that I would stand out. Usually, you send off little swag, a t-shirt or a little gift bag or something and it’s typical – people get that type of thing all the time. But they had never gotten anything like this before. And not only have they not received anything like this from the mail that stood out, but this is something they kept. They put it by their computers and they remembered every time they hit that thing, oh, Joel gave that to me. So, I brought the story of that book to life by creating a promotional item that would stick in people’s memories. That’s storytelling. Jason Hartman: Sure, yeah, it is storytelling. And it’s amazing how important that is. Speakers talk about it all the time. You’ve got to tell stories from the stage. It goes back to the ancient Greeks and the way they would do their performing arts and tell stories. There are definitely formula for it. I mean, Joseph Campbell and his Hero’s Journey is a very popular one, but there are some other formulas for it as well, not just The Hero’s Journey. So, good advice. Joel, what do you think is really one of the best platforms for marketing nowadays? Joel Comm: Well, I hate to say it but currently Facebook is the best platform in terms of reach. I think the tide is going to turn because it’s getting harder and harder to reach people, especially having an organic audience on Facebook. But as of now, if you know what you’re doing and are keeping up with technology and the tools that are available, you can reach a lot of people for very low investment. Jason Hartman: So, I knew the answer before I asked you the question. I knew you were going to say that, so that’s great. But why do you think it’s going to change? And why do you think it’s inexpensive now? Is Facebook just sort of developing momentum? Are they trying to just outdo Google? I don’t know if they’ll outdo Google – the companies are vastly different in their model and so forth. But what’s the reason it’s a bargain right now? Joel Comm: Well, I don’t know that it’s a bargain. It can be if you know what you’re doing. Just like with AdWords, if you don’t know what you’re doing you can blow through a lot of cash really quickly. So, I don’t want to mislead and make anybody think that it’s that easy. If you know what you’re doing, it can be simple. The thing with Facebook is that you don’t have to have a huge following or a big fan page to advertise and to target other people’s audiences. And because there is such deep targeting available on Facebook, that makes it a really, really powerful tool for advertising. The reason I think that it’s not gonna be forever is that Facebook is getting backlash from people who have spent a lot of time and money and effort building fan pages. But the organic reach of those posts on the fan pages continue to fall, where you might have 10,000 fans to your page but only 500 see the posts that you put out because of their EdgeRank algorithm. And I see that the reach is going to continue to decrease as the cost to reach those people that already said they like your page increases. And the problem is that none of the current platforms were built with commerce in mind. They were built with the thought of getting as many people using it, as many members. It’s really no different than the oldest advertising models we have. If we have circulation, then we have eyeballs. And if we have eyeballs, we can charge people to reach those eyeballs. And there has not yet been a social platform created that is developed for commerce, to make it easy for businesses to reach the audiences that say they want to hear from them. And so I don’t know where it’s gonna come from, but I think it’s gonna come out of nowhere. I wish I was the guy to build it. I’m not the one but somebody’s going to and I think it’s going to take the whole social world by surprise when somebody comes out with a platform that is designed for the consumer, for businesses, in a social manner and that works perfectly in line with mobile. Jason Hartman: Well, that’s a really interesting statement. I mean, of course Facebook wasn’t designed that way. We all know the story of how it was developed. But how would it be designed for commerce? I mean, you can actually buy things and sell things on Facebook pages now. There are applications for that. What would be different about it? Joel Comm: Well, the problem is that a lot of these companies have paid to acquire likes to their page, paid to acquire their fans. Now they’re having to pay again to reach the fans that they already paid for. This is problematic. This is basically telling the businesses who are giving Facebook their money that it’s a slap in the face. It’s to say, okay, we’re glad you spent that money to generate people who say they like you and want to hear from you, and now we’re going to charge you again so you can actually reach them. Jason Hartman: Philosophically or conceptually, it almost gets worse than that because with the new system – I guess it’s not that new anymore – where you can actually upload your external email list into Facebook and it’ll find those people for you if they’re on the platform. Then you can advertise to them. Businesses again must be thinking. . .I mean, philosophically that’s what I’m thinking. Wow, I paid to develop this list. It might have taken me 10 years, trade shows, advertising, whatever, however I got all those opt-ins. And now I’m gonna stick it into Facebook and pay to reach my own list through their platform rather than just through my email server platform. Joel Comm: Exactly. It’s brilliant as far as Facebook goes as a company, but I think that there’s going to come a point where it’s all about building a better mousetrap. And somebody’s gonna come along and they’re going to provide a platform that is way more commerce friendly and it doesn’t seek to ding companies twice or 3 times for the same activity. And Facebook’s entrenched, they’re stuck with the system now. This is what they’ve got. They can’t make a change. They can’t go backwards. So, the question is how do you create a platform that welcomes commerce companies of all kinds and consumers to the table and connects them in a way that this is the origin of the site. And there hasn’t been one yet and I believe there will be. Jason Hartman: Very interesting, yeah. It’s hard to imagine what’ll be next. And it’s so hard to imagine dislodging a player like Facebook. Google’s tried it a couple of times. And I guess with Google Plus, they’re sort of doing it in a different way but not really. Still everybody’s using Facebook. Joel Comm: Well, everything gets dislodged. Jason Hartman: Look at Myspace. Joel Comm: Yeah, look at Myspace, look at Apple. Apple was dead in the water. Microsoft owned the desktop and now everywhere you go, people are carrying iPhones and iPads and MacBooks and Apple is the world’s biggest company now. Jason Hartman: No question, but it’s a little different. Joel Comm: Change happens and it will continue to. Jason Hartman: It does happen. The only thing I’m saying is that with social networks, it’s so darn sticky because you’ve got to get people to move in mass. I mean, if you’re already connected there, why are you going to go somewhere else? It’s pretty sticky. Joel Comm: It’s very sticky but it will happen. Jason Hartman: Alright, good, yeah. That’s good. What else should we be talking about, Joel, just in the time we have left? Anything you want to touch on in particular, whether it be the next internet millionaire show? Maybe some of the experiences there and what you saw or any general advice for business people, whatever? Joel Comm: I think I was early to the game with The Next Internet Millionaire. I was inspired by reality TV such as Trump’s Apprentice show and I saw the rise of YouTube, and this was back in 2007, and we produced and hosted the world’s first competitive internet reality show. It was a full 13 episode program shot with 4 cameras in the studio with real contestants and real trainers and real challenges and real prizes. And it’s amazing because even though it’s been 7 years since we were shooting this program, when I go to events I still have people coming up and telling me that they saw the show and when am I gonna do another season? And I laughed because it was so much work to do it and my answer is when a production company comes along and says they would like to pay to do it and have me be a part of it. And until then, it’s such a huge effort. And if anybody wants to see the show, it’s out there, NextInternetMillionaire.com. And the Hulu Network called Realism TV that should be launching soon approached me and they want to actually put this on Hulu. I guess a lot of what’s in there still rings true for people wanting to get started marketing today. Jason Hartman: Yeah. It’s amazing a production company hasn’t taken you up on that by now or some big studio because you look at the success of Shark Tank for example, and wow, it just seems like this would be a natural. Joel Comm: Yeah, we were before all that, before Shark Tank, before Undercover Boss. And I think that the climate is more ripe for it now than ever before. So, it’s not something I’m actively pursuing, but if it happens to come my way, then I’d certainly be interested in looking at it. Jason Hartman: Fantastic. Well, Joel, thank you so much for joining us today. Give out your websites. Tell people where they can find you and where they can find your famous app if you want to tell them about that before you go. Joel Comm: Sure. Well, I’m the easiest guy in the world to find. I’m the only Joel Comm in the world. So if you go to JoelComm.com, there’s my blog and on any of the social media sites I am @JoelComm. Jason Hartman: Fantastic. And you want to tell people about your app before you go? I love this. Joel Comm: Sure. So, I created a novelty app back in 2008, the year the App Store opened. And myself and my team, comprised of mostly males, thought it would be funny to create an application that would simulate flatulence, a fart machine. And so for those who don’t know, I am the creator of the now world infamous iFart Mobile that exploded onto the charts, made a bit of a stink and took the world by storm in 2008, went to #1 in the iTunes App Store for over 3 weeks and more than 5 years later it still sells like clockwork every day to kids and kids at heart everywhere. Jason Hartman: Hey, Joel, will you share some of your numbers on that? I didn’t know you then but I remember when that app came out and people were talking about it. I think you were selling it for $0.99 and I heard you sold like a million of those just right away, really quick. Joel Comm: No. Whatever you heard, the million, yeah, that was rumors. But to date it has sold over 800,000 or so. And I think with the free version, there’s been well over a million downloads. And it still sells every day. It’s pretty funny. It’s usually in the top 200 of the entertainment category in the App Store and has been for just about every day since it’s launched. Jason Hartman: And I mean that had to be pretty simple to develop, right? Joel Comm: It was. Fortunately, I had a talented developer on my staff, I had a talented designer, and they were able to pull it together and the initial version in just a matter of weeks. And so it’s crazy that you can spend $5000 and make a half million, but sometimes the simplest ideas are the best. Jason Hartman: Yeah, definitely true. What a great era in which we live that you can actually pull that off and do it. And so that’s great. Well, Joel Comm, thank you so much for joining us today. Joel Comm: It’s been my pleasure. Thanks again for having me.